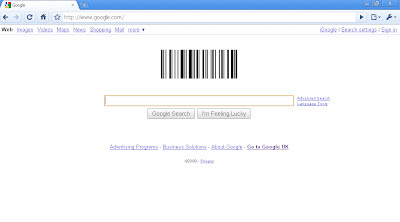 The Google Barcode Doodle: A Harbinger of the Internet of Things? However, today, we get vertical black lines. These lines are easily encodable using Code 128 (a standard way of encoding ASCII character strings into bar code), but absolutely meaningless to a human being without a bar code scanner. It seems that today’s Google Doodle is somewhat more meaningful than the 57th anniversary of a bar code patent (who celebrates a 57th birthday anyway?). The Doodle is a harbinger of the coming Internet of Things and a machine-readable world (a topic I’ve previously blogged about in detail). Google is undoubtedly ready for an Internet in which it not only indexes much of the material (i.e. non-virtual) world, but also allows code to perform searches. Before long, our ovens might be Googling for recipes and cars might be Googling for mechanics, and searches performed through Google’s ASCII interface could become a small part of the work that their algorithms are carrying out.